It’s almost November already? Don’t be glum chum. If you are super quick there is some freebies & limited offers… Because we love you. For the Love of Alternative Comedy. Long Form Comedy for the Discerning. So much good stuff to tell you guys! Soon to be legendary new shows. Kids Gigs & the almost instantaneous return of a Funny Looking Favourite. Hidden Freebies in ticket links. Exclusive £4 Tickets here for Jordan Brookes available for the Mailing List – if you add the code MAILING. Join us: Facebook & Twitter. Get on board quick, they’ll all be doing it soon. It’s this week! Oh my goodness. Just have a dig around to see how good this champ is. You’ll come to this gig and bring a friend and they will never stop thanking you, I can tell you. Jordan currently features FL fave Kiri Pritchard McLean’s Comedy Short on Sky. It’s a brilliantly dark. Some details here. Following this we have our Live Chat Show, featuring Liverpool Echo What’s On Comedian of the Year (Will he ever stop going on about it?) Top Joe, Lee Hithersay & Rob Bond. Also debuting in the new feature – ‘The Hot Spot’ will be Rebecca E Clarke. All of this for a bargain price if you buy in advance. And it’s still a stonker on the door! Do we have an early Christmas present for you?! Following the smash hit that was the first ever Funny Looking Fringe, come and join us for a special evening of collaboration, where the greatest comic minds in Liverpool’s alternative scene collide to bring you something incredible. Uniting their comedy muscles to flex the bicep of laughter Travelling Wilburys style (or whichever supergroup you find applicable to your lives), Shaved Dog Comedy, Jim Alsbalstian’s Human Zo and Rebecca E Clarke join forces with all former members of the Legion of Doom. It’s a show unlike any other – never before seen material, all new sketches and characters, and the scene’s most popular writers and performers in unprecedented combinations. “Hi(!) & Wow! It’s me! Top lad Sean Morley. Here I am with some of the biggest best jokes, really ready to smash the gig, raise the roof, raze the venue and salt the Earth. A show about divesting all your responsibilities. As heard on BBC Radio 2, 4 & 4 Extra. Top nonsense. Guaranteed idiots. Definite Silliness. Almost certainly a bonkers time. Expect chaos and expert tomfoolery from some the best comic around. Copyright © 2016 Funny Looking Pod, All rights reserved. Did you win the Golden Ticket? Probably not… But there are free tickets for you still! The Liverpool Comedy Festival starts this week and after months of planning, so lumbers the Funny Looking Fringe. Dedicated to bringing the best in Long For Comedy. One hour shows to delight, enthral, enchant, challenge, engage and mostly make you laugh. How you can get your hands on more Freebies! 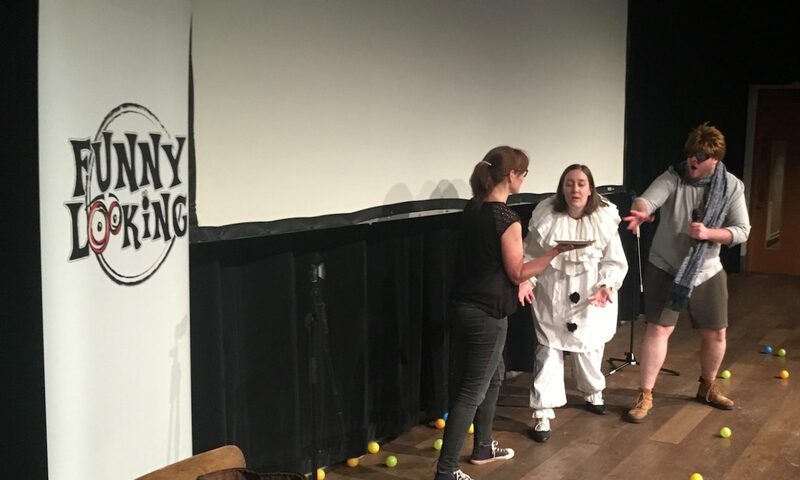 With first time hours, master works in development and acres of finely honed comedy that is fresh from the Edinburgh Fringe Festival; we are a broad church of choice. Comedy for kids, music, podcasts, impro, stories, sketch, magic, mayhem, chaos, jokes, japes, jumbles and a joint we will get jumping with laughter. There is something here for you and all your pals. Bring them. Come along, take a punt, stay for a coffee, cake and a beer. Be entertained. Be enthralled. Be challenged. Be part of the Liverpool Comedy Fringe that is Funny Looking. We drew the winner for this years Golden Ticket at the Launch of the Festival. As you can see we are above reproach – we asked a politician to make the draw! Gemma supported the Liverpool Comedy Festival last year and is over the moon! Launch Gala with Bido Lito! In partnership with Bido Lito we are launching this Fringe in style this week. With music and comedy combined, come get a taster of the acts to come for Free! To book your free ticket. Short Cuts and bite size joy injections. Did you see the article they did on the Fringe? What corkers! – It’s onlineHERE. This is a grassroots Fringe, unfunded & dependent on your help sharing the list, telling people about it retweets, shares and likes really do help. Get excited with me will you? Our true opening night couldn’t be better. Click the link for a taster of the show & a chance to read the superb reviews Doug snatched in Edinburgh this year. We are big fans of this up and coming comic with a assured sense and voice that only Ashton’s finest can produce. EXCLUSIVE: Type the code MAILING into the Get Tickets link to access very limited £4 tickets – once they are gone they are gone! Super Saturday – with four shows and something for the whole family! Fresh from Ed Fringe – EXCLUSIVE: Type the code MAILING into the Get Tickets link to access very limited£3 tickets – once they are gone they are gone! A new show from this funny and thoughtful comic. EXCLUSIVE: Type the code MAILING into the Get Tickets link to access very limited£3 tickets – once they are gone they are gone! A whole hour with the new Liverpool Echo and Laughterhouse Stand-up of the year Finalist! EXCLUSIVE: Type the code MAILING into the Get Tickets link to access very limited£3 tickets – once they are gone they are gone! Super Saturday – Three gigs to rule them all. If you miss these dreamboats you will have missed one of my personal favourite days on the Fringe. EXCLUSIVE: Type the code MAILING into the Get Tickets link to access very limited £10 tickets for all 3 gigs! – once they are gone they are gone! A debut hour from this Gein’s & Funz & Games award winner! Kiri’s posters at Ed Fringe were covered in 4 star reviews – click the link to read them and see why this was a Guardian recommended must see! What? you want a brand new show from this troupe of BBC Radio Waleslegends? Ok. EXCLUSIVE: Type the code MAILING into the Get Ticketslink to access very limited £10 tickets – once they are gone they are gone! Would you like to see almost every single funny looking fringe at the Liverpool comedy festival gig for free? Of course you would! Who wouldn’t? Funny looking is going to give away a Student only Golden Ticket. Allowing you the ability to just swan into every gig and not have to hand over any of your sweet folding. Click here and add your email address and enter the draw. Not transferrable to anybody other then the winner. Just £8 will get you a Funny Looking mug and as you sip your cup of joe you will know that you have supported our endeavours to give new and alternative comedy a gloriously different at home in Liverpool. Funny Looking enters its 3rd year as the official podcast of the Liverpool Comedy Festival. Search iTunes or your pod catcher for Funny Looking. Funny Looking Live has returned to Spreaker on a Sunday night. Chat calls and topics. It’s either the best or the very worst way to start or finish your week.